Maybe you will have heard of Ameira before? Who did sadly split ways as a band last year. They played our yearly Scunthorpe Nights event as we said farewell to the boys. Drummer, James Hughes joined the increasingly popular local band ‘The Native Braves’ but Lead singer Luke and energetic bassist Gary are back in a new formation under the name of ‘Years Young’, which they formed in November 2014 and have been quietly, or not so quietly hammering out some new and fresh material in their practice space. Luke & Gary are now joined by their two newest band mates, Ollie on Drums and Danny on guitar. So make way for the new alternative rock band to the area. If the material and standard of Ameira is anything to go by then Years Young are going to be a band to watch this year. The boys are set to record in the studio this month, so you hopefully won’t have to wait too long in anticipation for a taste of their new EP. They only announced their new venture a couple of days ago but already they are up to over 400 likes on social media. So give them a share and show your support. And if you just can’t wait to hear something from Years Young then get to the boys Facebook page where they have posted a nice little acoustic surprise for you. Our only show this year in collaboration with SMB Management & Promotion named #AlterEgo, which will take place on 20th December 2014, promoting live alternative music locally in the town centre of Scunthorpe at Cafe INDIEpendent. This gig is a one off, unless obviously demand calls for more in the future we will look into it. But we thought we would make it special. First off we started out with 5 golden tickets, we are now down to 1 golden ticket. The next winner will be drawn this week. You can still enter via the pinned competition post on our Facebook page here. Over 50 people entered via ours and SMB’s different platforms, so we were overwhelmed with the support and interest shown. There will be no tickets for this event other than the 5 golden tickets, the rest of admission will be £3 on the door on the night. Firstly we announced AMEIRA as our headline band, as this will sadly be their last gig since their recent split it’s a chance to say goodbye or hello if you haven’t had chance to catch them before. These boys are great, so great that BBC RADIO ONE chose them as their track of the week last year. Secondly we were unable to disclose the name of the ‘special signed guest band due to them re branding and switching up genre styling. 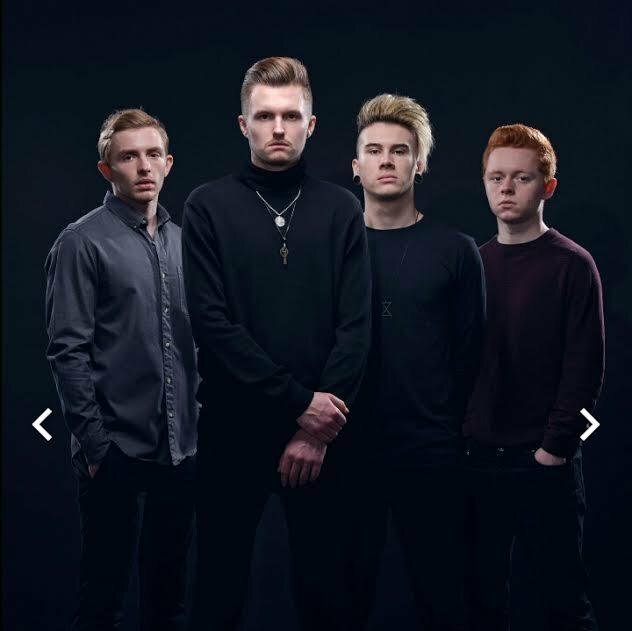 But they have now released THE COLLIERS will be joining as main support, but the band are now called IRON HANDS bringing you some rock n roll from North Axholme. The boys have been recording their new material in London but are yet to release their new EP, all we know is it’s coming soon and it’s called ‘Noise Yard’. Before they visit Scunthorpe they will be stopping off to support a band called “Angel At My Table” in Sheffield, Manchester and Newcastle. Last but not least we have ODD RIVAL a British Indie Rock band from London. Who have just released a couple of new tracks and some videos. Welcome to the press release for our ONLY event this year. Who knows when we will do one again. We have hosted ONE OFF events before but since the live music scene kick started we have been behind the scenes helping other people promote their events and music. It’s now time for our Annual appearance. This will be a limited capacity event. We are pleased to announce the event will be held at Cafe INDIEpendent, a place to enjoy music in the town centre with a real community feel and great gig atmosphere down in the basement. This will be an intimate gig, with plenty of energy. Music to jump around to. Please join us to celebrate us nearing almost two years up and running as your local non profit community organisation Scunthorpe Nights. This is will be a NO TICKET event, so it’s payment on the door only! Show up early to avoid the risk of not getting in. Once capacity is full, it’s full. £3 ON THE DOOR. So that’s Three bands for £3!! As the name #AlterEgo suggests, it will be primarily alternative bands. Not heavy metal but a little more rocky. If you haven’t heard of the bands in the line up it is recommended you check them out as you never know they might turn you into an alt rock lover. Join us in wishing the boys farewell as this will be Ameira’s FINAL gig. THE SPECIAL GUESTS we cannot name due to this being quite an exclusive to get them. We can say they’re a signed band undergoing a new image from out of town. So this has to stay Hushed for now. Odd Rival is a Indie Rock band based in London. The band is fronted by brothers Patrick (bass/voices) & Chris Smith (guitar) alongside Alastair Batchelor (drums). To support the event you can use this facebook banner. Much interest has been shown over the past week in the idea of a NEW Alternative Disco in town. We have been running a survey to find out what you want. Please let us know your opinions. Venues most mentioned have been The Baths Hall and Cafe INDIEpendent. The only problem with these venues is for a disco purpose is size and cost. There would be no disco lighting and built in DJ system in a such venue as Cafe INDIEpendent meaning the money would have to come from somewhere to start this voluntarily organised night. And the Baths Hall would be a large area to fill. Abacus have shown interest in offering a Friday as an option with a selection of available dates but the rule (If it is not busy enough it ends at 11pm and normal club music starts). We urge any venues interested in this night to please step forward so we can consider all options and venues. We don’t want to do things by halves. This type of event has to be done right. Chances are the trial won’t be perfect but it gives room for suggestion and improvement on future events. Ideally it would be great to move the bi-monthly/monthly disco around venues in town that suit the genre.